The European Union has had an image problem of late, as political forces from left and right, and north and south, like to portray it as a source of new and old economic and social problems. Yet the critics of Europe often seem to forget that the EU has been a stunning success in delivering peace and prosperity for the countries of Europe since its foundation a little over 60 years ago. Globally, Europe stands out as the region with the fastest convergence of living standards over the last four decades, as the EU accelerated the development of poorer countries through its enlargement, the single market, and structural and investment funds. Moreover, Europe’s “convergence machine” has been resilient to the recent economic crisis and recession, most spectacularly for its newest members: Romania’s GDP per capita increased from 35 percent of the EU average in 2005 to 58 percent in 2016, while Poland became a high-income country faster than any country in the world except South Korea. And yet the convergence machine is increasingly not delivering for all Europeans. Europe is seeing growing divides with widening productivity gaps between firms and growing inequality in labor incomes. Accelerating technological change is driving a wedge: As Europe’s jobs increasingly emphasize non-routine, cognitive tasks that are complementary to what machines can do, high-skilled workers see their incomes rise. Meanwhile, low-skilled workers lose out as manual jobs become scarcer. While Europe’s frontier firms are among the global elite, its lagging firms increasingly fall behind global competitors. This growing divide has a spatial dimension, as countries, regions, and cities with a high concentration of high-skilled workers and frontier firms thrive, while other places languish. All of this is brewing discontent, with rising concerns about inequality and declining trust in governments’ ability to tackle it. Populism seems to be the winner. The World Bank has recently proposed that Europe should upgrade its convergence machine to keep up with technological change and to ensure that economic growth continues to deliver better living standards for all Europeans. This “convergence machine 2.0” would focus on equalizing opportunities for people and for firms across the Union. How? As firms in countries and regions of Southern Europe face a less supportive environment for doing business and innovation than their peers further north, they remain small and relatively unproductive and less likely to adopt new technology. Microenterprises account for 42 percent of employment in Southern Europe, but only 20 percent in Northern Europe where they are also more productive. Resulting stagnation in productivity undermines economic growth prospects. With significant variations in the business environment between EU regions and countries, governments need to re-examine regulations and their enforcement across cities and regions to ensure firms find a level playing field and equal opportunities. Businesses in Europe’s lagging regions would especially benefit from such policies. Meanwhile, countries in Northern Europe provide an example of how to support firm innovation and technology adoption through good information and communication technology infrastructure, incentives for enterprise-sponsored research and development, public funding mechanisms and intellectual property regimes that foster profitable relations between universities and firms, and a steady supply of high-skill workers and managers. Equality of opportunities for people starts by ensuring that all children get a chance to acquire the necessary cognitive and social-emotional foundation skills like reading, mathematics, problem-solving and team skills to be prepared for an increasingly technology-driven labor market. Strikingly, many graduates across the EU struggle with text and numbers. 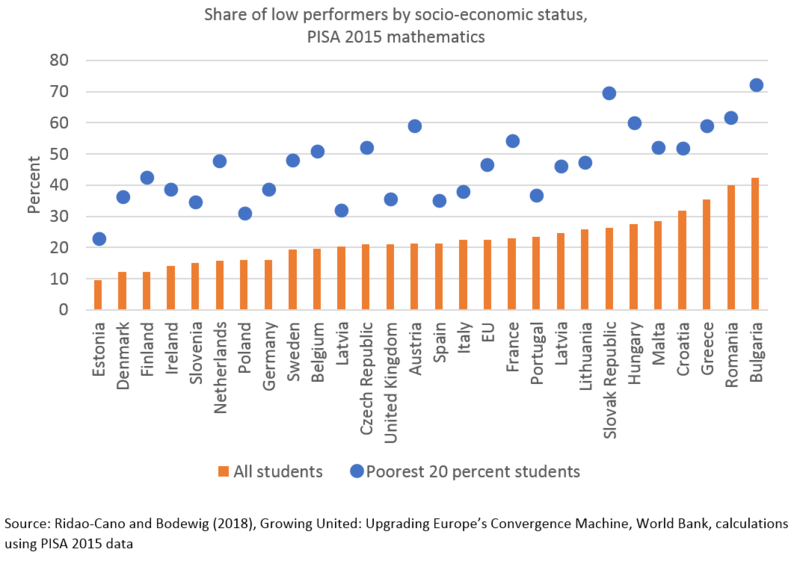 On average, more than 1 in 5 Europeans aged 15 performed below basic proficiency in mathematics in the Program for International Student Assessment (PISA) in 2015. This share ranged between 10 percent in Estonia and a staggering 40 percent in Bulgaria (see Figure 1). Most importantly, much of the poor performance of students is driven by socio-economic disadvantage, as 15 year-olds from the poorest families are twice more likely to be poor performers than the average student. As jobs are increasingly about non-routine cognitive tasks, such skill gaps are a social and economic time bomb for an aging and shrinking European labor force. Boosting opportunities for Europe’s future workers requires improving learning outcomes of children from disadvantaged backgrounds by better linking social and education policies and by tackling social segregation in schools. Some countries in Europe have taken the initiative in embracing a pro-equity agenda: Take Finland and the Netherlands, which are rethinking and piloting partnerships at the local level between schools, social workers, and the nongovernmental sector to ensure that education and child well-being go hand in hand. Equality of opportunities is not just about endowments (skills), but also about establishing fairness in the labor market: As technological change disrupts labor markets, both security and flexibility matter. Yet social protection and active labor market policies vary widely across countries. And Europe’s workforce experience growing duality between those in well-protected permanent jobs and mostly young people on repeated and less secure temporary employment contracts. More flexibility should go hand in hand with decent job quality, better protection of workers as opposed to jobs and better social protection benefits linked to the individual worker and that rely more on noncontributory financing. While many of the policy levers to upgrade Europe’s convergence machine rest in the hands of national and regional policymakers, the EU is an important enabler of necessary reforms by providing a platform to promote policy coordination and mutual learning between member states. European structural and investment funds can help test new approaches in tackling social and regional inequalities. As technological change paces ahead and countries in Europe look toward an uncertain future, the time to upgrade the convergence machine is now.